MaAfrika Tikkun was established in 1995 as a foundation to make a difference in the lives of underprivileged South Africans through empowering communities to uplift themselves. 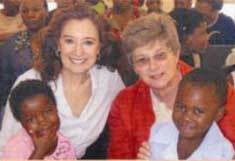 MaAfrika Tikkun has projects running throughout South Africa.MaAfrika Tikkun’s Hillbrow Project – a crÃªche – is based at Temple Israel in Hillbrow. MaAfrika Tikkun supplies this project with equipment for the school and training for its teachers, and the children are taken on various outings during the year. “In the early days, MaAfrika Tikkun was approached to develop projects that would assist disadvantaged and impoverished communities in a variety of ways,” says the review.